A substantial report commissioned by the Scottish Executive to summarise definitions of the concepts of quality of life and well-being and measures available. It also relates these to the potential impacts of culture and sport participation at an individual and community level. Professor David Bell reviews the literature related to economics and subjective well-being. Susan Galloway and Nicola Sneddon review the social research on quality of life and wellbeing in relation to participation. Christine Hamilton and Adrienne Scullion present a ‘think piece’ drawing on the findings of the literature reviews. Galloway, S., Bell, D., Hamilton, C., & Scullion, A. (2006). 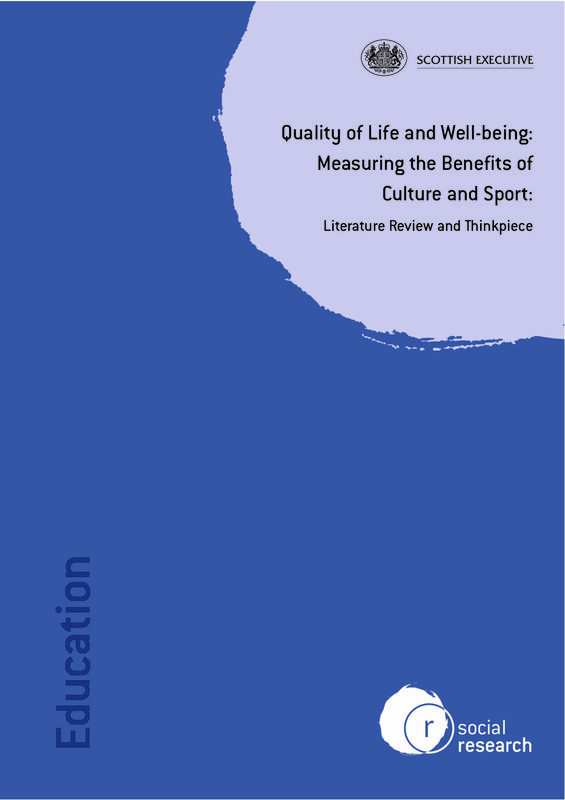 Quality of life and well-being: Measuring the benefits of culture and sport: Literature review and thinkpiece. Edinburgh: Analytical Services Division, Scottish Executive Education Department.